I decided it was hypocritical to have written a book about separation anxiety, yet have a dog with separation anxiety that I had not tried to fix! Cassie has the shoemaker’s children syndrome – so busy he had no time to make shoes for his own kids! Cassie had no shoes! Cassie will be 8 years old in August. 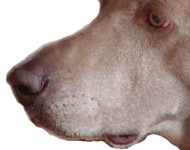 She is a Weimaraner. I have done lots of training with her including obedience, hunting, rally, agility, tracking, K9 Nose Work. She has mild to moderate (on some days) separation anxiety. She’s always had it, but in the last year, it seems to have gotten a little worse. When I leave, I usually give the girls a Kong. One, if Dave, my husband, is home and multiples if they will be alone. I give them each one Kong and hide the others around the house for them to hunt up and devour. If I leave and Dave is home, he tells me after she finishes her Kong, Cassie begins looking for me. She goes from window to door to door looking for me each time she hears a noise. This goes on the whole time I am gone. She also howls forlornly (I know that’s anthropomorphizing!) sometimes. She surfs anything that is remotely edible on the counter. She barks frantically when I come home and paws the door and jumps about. The back door is metal, and she has actually put a couple claw marks in the steel door. The door frame has been clawed extensively. She used to be destructive, stealing personal items with my scent on them and chewing them. These days, she will still steal the personal item if I slip up and leave something out, but doesn’t destroy it. She is partial to hats, gloves and shoes. I recently redecorated the room adjacent to my kitchen and turned the whole room into a pantry. In the process I started stacking storage bins in front of the window she used to look out when I was gone, waiting for me to come home. The storage bins are stacked 3 high. This is too high for her to be able to see out the window and look for me without standing on her hind legs. So she has now taken to jumping onto the small table we keep in there so she can see more easily! Standing on a table is unacceptable for any dog, but especially a dog as big as a weimaraner! So now I stack four of the bins in one stack and two in the other. She will now sit on top of the stack of two bins and not on the table, which is better–not great, but better. She is very stressed while I am gone and I hate to know she is so distressed. When I leave the girls alone now, I always put a t-shirt I wore the previous day by their beds. So far they have not destroyed any of my clothing! This whole thing with Cassie standing on the breakfast table and also writing the book were what made me decide to finally work on fixing this issue. It’s not healthy for her to be so stressed when I am gone and it is well past time to try to fix it! She is such a great dog, she deserves to grow old with a lot less stress in her life. I have the luxury of being able to take my dogs with me a lot of time when I work a lot of the time. I frequently use Cassie in my work. The dogs are much happier being with me, even if it means being crated in the car, than being left home alone. But the weather has been very hot, in the 90s. Even though I park in the shade, put sun barriers in the windows, give them ice water, leave the back of the car open with their crates padlocked, and turn their fans on high, it’s still too hot for them, so I’m forced to leave them at home.